Sonic Process: Monoceros "Tales From Late Night Remixes"
Poll: What do you think of the new blog layout? Nick Cave & The Bad Seeds "Dig!!! Lazarus Dig!!!" Hercules And Love Affair "Hercules And Love Affair"
Telefon Tel Aviv "Map Of What Is Effortless"
Sons & Daughters "The Gift"
Monoceros "Tales From Late Night Remixes"
Total running time: 73' 00"
Sonic: Free releases rarely come as good as this: gathering a host of glitchy electronic artists Monoceros' remix collection not only stands very strong on its own, but provides us with an excellent starting point to discover many of the artists that have helped to make this such a great record. Highlights include Maps and Diagrams' Warm remix, with its glitchy beats and warm synthesisers that recall Xela's "For Frosty Mornings and Summer Nights". 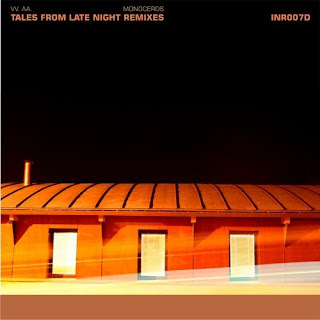 Crisopa's Tales For Silent Nights' remix, with its up-tempo beat and acid sounds, reminds me of Kettel's "My Dogan". Flüor's Happiness remix manages to pull out the difficult blend of ambient pop with classical piano to great effect. An On Bast's own rendition of Happiness is a much meaner affair, with its saturated beats providing for some good but way too short head-bouncing moments. Recommended. what is happening? I´m waiting for some new tuuunes! You guys got without no doubt one of the best music blogs known to man! Best regards from the arctic side of the world. Hallo, ich kam durch Zufall auf diese Seite und möchte einen netten Gruß hinterlassen. Ich würde mich freuen, wenn ihr auf meiner Homepage auch einmal vorbei schauen würdet! Vielleicht wollt ihr einmal auf Sylt Westerland http://www.MeerblickSylt.de oder an der Ostsee http://www.OstseeblickHolm.de Urlaub machen?! Wir haben dort sehr schöne Meerblickwohnungen. Vielleicht bis bald einmal! Pretty nice place you've got here. Thank you for it. I like such topics and anything connected to them. I would like to read a bit more soon. I opened the meet by chance. Have read. Lets have more knowledge. I like this website offline. Thanks for your work. Nice posts. Could you link me back? Jahrzehnten eine signifikante Zutat des Essens der Indianer dar. like rapidshare, megaupload, hotfile, etcetera. of your website or business in the online world. started thinking of an easier alternative of being successful in their mission. move slowly when deciding on who becomes the company's SEO. The concepts make use of the current social networking sites, which are very popular among the online audience. Basically, if you create links to your website with "ink cartridges" or "printer cartridges" in the anchor text, it will help move your website up on the search results for those key words. No - you name some of your images "breast. Know how to get better rank. As of now, Thomas Lenarz has helped many people get the information on reputed SEO companies. Online Advertising and SEO Marketing. A person can find all sorts of products available at various prices on the internet. The website serves as a way for customers to find the business and be able to see what services are offered. Addition and updation of fresh content always leads to arrival of increased traffic to your websites. Αlthough уou can't go back to any songs, you can skip songs, mark them as ones you like or dislike, and browse the names, bands, and CD the song is on of all the songs that have played already. Yet another way to construct a device to harness energy from radio waves is using an antenna, connected to a series of diodes and a capacitor bank that is earthed. It is a more reliable choice when compared to traditional concrete or wooden barriers for several reasons. 1. If the executives promise high traffic then understand you are talking with a non-SEO person. that are spamming keywords or made solely for the purpose of advertising. regarding the quality of the service they get. He has also mentioned each and every seo service. Now, if it takes you three years to referrer 3000 members which means that you receive US$3000 per month. into trouble. In fact, soon, not using RDFa could put a site at a disadvantage. engine algorithm devised by that particular search engine. they do have the added feature of user-replaceable batteries. heroes they choose to be. It's actually a nice and helpful piece of info. I am glad that you shared this useful info with us. Please stay us informed like this. Thanks for sharing. could write a litte more on this subject? I'd be very thankful if you could elaborate a little bit further. Kudos! let me tell you, you've hit the nail on the head. The problem is an issue that too few people are speaking intelligently about. I am very happy that I came across this in my search for something regarding this. term and it's time to be happy. I have learn this put up and if I could I want to suggest you few fascinating issues or tips. Maybe you can write next articles referring to this article. I want to read even more things about it! Hello there! This post couldn't be written any better! Reading this post reminds me of my previous room mate! He always kept talking about this. I will forward this article to him. Pretty sure he will have a good read. Thanks for sharing! It's remarkable to pay a visit this website and reading the views of all mates about this paragraph, while I am also keen of getting experience. This blog does not store any files on its server. The postings are for promotional and preview purposes only. If you like what you hear please support the artists by buying their works. Stig Inge "We Love Netlabelism Vol.1"
Stig Inge's deep tech beats take you on a dive deep down into the sea. There you'll find a parallel world of echo sounds, coloured corals and forgotten, sunken cities, just waiting to be discovered and explorerd.